About an hour away from ABQ airport and a good half-an-hour from Santa Fe lies the historic and interesting little town of Madrid and just to the North, Cerrillos. We stayed at the Hacienda Dona Andrea de Santa Fe which was perfect. The site can explain more but a commercial kitchen with nine bedrooms and a great meeting space made it perfect for a corporate retreat for our group. The only drawbacks were there wasn’t much in the way of entertainment there besides a small television and no exercise equipment, but the Ortiz Mountains lie right outside the front door and the mountain top there is climbable – you just need to blaze your own trail and avoid those pesky ground cacti which seem to be everywhere on that hillside. The views from the top are spectacular and allow yourself a good two hours to the top and back down. Some says the stars in the country are amazing and I can attest to that but the star gazing from the back patio of the Hacienda is indescribable. I’ve never seen stars so brilliant and so many. Words can’t describe. Cerrillos (population 229) is just off highway 14 and there is a nice state park there with 5 miles of well maintained hiking trails. Good exercise but not strenuous. My only regret of the trip was not stopping at Mary’s Bar. Based on the Yelp review, it would have been a site to see! We took a self-guided walk through the Cerrillos Catholic Cemetery and that was an interesting visit – the freshly attended tombs made you understand some of the history and the continuity of much of the family populations who still live here. 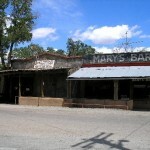 Madrid (population 204) is right on Turquoise Trail and has a historic and artistic feel. Stories of Walt Disney’s inspiration of their annual Christmas displays are well documented as are the stories of ghosts and hauntings throughout the town. While we didn’t see any ghosts, we did see a coyote running right down the middle of main street without a care in the world. I might rather the ghosts! 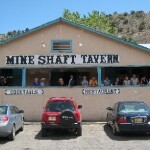 The coolest place in town, as seen in several movies including Wild Hogs, is theMine Shaft Tavern (the MST to locals). The owner, Lori Lindsey, was on-site and incredibly friendly to us. The MST closes during the week at 7:30PM but she kept the place open late for us and some local folks. We learned a lot of the history of the town and it is easy to see why this place is a destination along the Turquoise Trail.